It is not just Team USA that are finding NBA players are dropping out in the build up to the FIBA World Cup, due to be held in Spain in August and September. 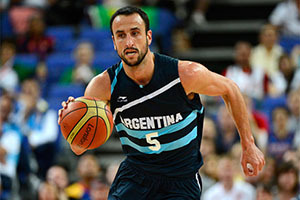 Argentina is going to have to play without the talent of Manu Ginobili, although this is all down to the player’s club, as opposed to the player himself. This is because the San Antonio Spurs have declared Ginobili unfit to play the World Cup. The Argentinean team doctors examined the player last week, and although they noted that there had been an improvement in the player’s form, the results were still inconclusive as to whether he would be fit enough to take part in the tournament. Clearly the national side were willing to wait as long as possible to allow Ginobili to be fit but is seems as though the Spurs are not accepting that and have declared the player unfit for the event. For someone who has declared a great sense of pride in playing for his national team, there is no doubt that Ginobili will be upset at this decision. There has been a lot of talk about NBA players pulling out of the FIBA World Cup because they don’t deem it important enough. There will definitely be some NBA teams putting pressure on their top players to avoid these summer events and to focus on relaxing and getting in great shape for the start of the new season. Ginobili is a player who has suffered in the NBA after a summer tournament and given that the player is now 37, you can see why his club would prefer to have no distractions for him. One player who has been heavily criticised for pulling out of the big summer event is Blake Griffin but it seems as though there may be some apologies heading in the direction of the Los Angeles Clippers player. Griffin has produced medical reports that indicate he has a fracture in his back. This will not require surgery but there is a need for the player to rest to ensure he will be fit to take his place in the training camp for the Clippers which will take place in September. Another NBA player that won’t be heading to Spain to play this summer is Maurice Harkless, from the Orlando Magic. He has decided not to make himself available for Puerto Rico this summer, instead preferring to get himself fit for the new NBA season. The player performed in 80 of the 82 games that the Magic played last season, starting in exactly half of the team’s games. Clearly playing for the host nation at a World Cup event is a big lure and Serge Ibaka, from the Oklahoma City Thunder, is promising he will do everything he can to be involved with the Spanish team on home soil. The player was at the centre of drama in the Western Conference Finals when his injury took away any hope that the Thunder had of besting the Spurs. With a month to the tip off in the 2014 FIBA World Cup, there are still a lot of changes to be made in the rosters that head to Spain, so you may find that this is the time to find proper value in some futures betting if you have a strong feeling for a nation.